The Curious Nibbler: The Works - It Works For Me! 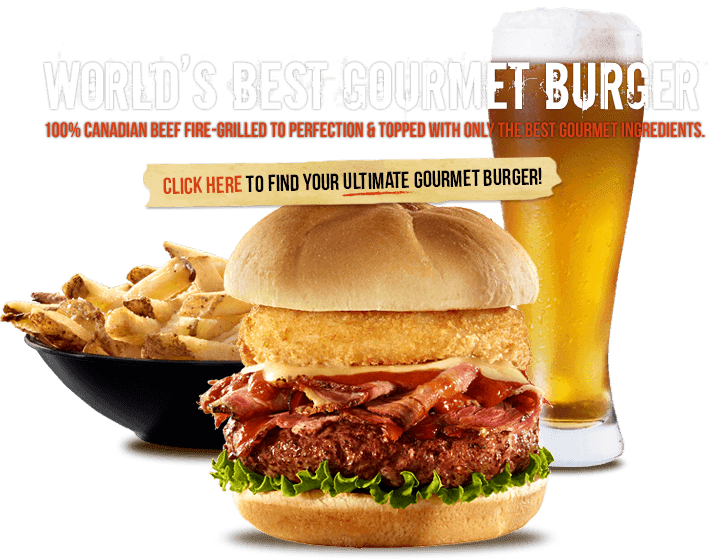 Apologies in advance for the lack of photographs, but our venture into The Works Gourmet Burger Bistro was a last minute decision after a long, hard day of perusing craft displays at Kempenfest under the bright sun! Yes, yes - I should have a phone and/or camera of my own with me at all times, and it may very well come to that soon, but for now I'm resisting 21st century technology as much as a food blogger can. I'm sure The Works won't mind if I borrow a pic or two from their website to showcase their goodies. We parked our car on Mulcaster St. and walked down to the festival, passing several Dunlop St. eateries and discussing their virtues on the way. My husband, 19 year old son and myself wondered out loud about The Works - we had heard mixed reviews. I said "There's only one way to find out for sure!" A few hours later on, we were definitely ready for something to eat, and there was The Works again so in we went. You will find them just a few paces west of Mulcaster St. on the south side of Dunlop St. E., number 137 in a long narrow space with a lake view at the back. I'm sure my eldest son played a show here once with his metal band during a previous life of this building. The interior decor is very industrial, with exposed brick, rough wood floors, pipes and gears, corrugated metal and even unusual serving vessels like glass measuring cups for your drinks and tin cake/roast pans instead of plates. Very funky! I understand The Works is a chain restaurant, but I didn't get that feel. Lots of young staff around - I figured it was all hands on deck with Kempenfest in full swing nearby. Our server was Shayla, a super enthusiastic server, definitely in the right job. And then there's the menu - oh wow! At first glance, it seems complicated. With several dozen burger selections, you might get a little alarmed, but once Shayla gave the 30 second burger course, I was much better. Pick your bun. I took whole wheat. Take note - they have gluten free too. Pick your burger. I'm sure most diners choose ground beef, but there's other choices like chicken, turkey, elk, veggie or even a huge portobello mushroom cap! Then pick your topping either by name or by number. Our son, who considers himself a master barbecued burger chef (and nearly curled up and died trying to find a decent burger on a trip to Scotland last year), chose the juicy lucy, which he told me, between big bites, contained an awesome garlic sauce and a cheesy seeming burger patty. My husband and I both got the teriyaki melt containing teriyaki sauce, sauteed mushrooms and swiss cheese, which begs the question - why have I never thought of putting teriyaki sauce on a burger before??? A new jar will be appearing in my fridge this week. The food was absolutely delicious. My veggie burger was huge and I was quite stuffed when I left. In fact, I was so stuffed I never ate another thing all day. I was even too full to have any desire to write about it until the next day! Of course, I could have used a bit of self restraint and left a bite or two, but it was too good! The fries were really good and so was the gravy, which is vegetarian friendly by the way. The pop was refilled often without a word. I saw the apparently famous tower-o-rings go by a few times. It's a tall stack of onion rings on a pole and it instantly reminded me of the old Fisher-Price stacking game for kids. Next time, I might try the poutine which is served in a bucket! So yes, there's only one way to find out if a restaurant is as good or as bad as they say - go and have a bite for yourself. It's only a gamble of a few dollars and an hour of your time. These three gamblers hit the jackpot and will be back I'm sure! I'll be checking The Works here on the Danforth and see what it's like! I just bought some mushrooms and teriyaki sauce ... going to try to replicate that awesome teriyaki melt I had last Sunday!